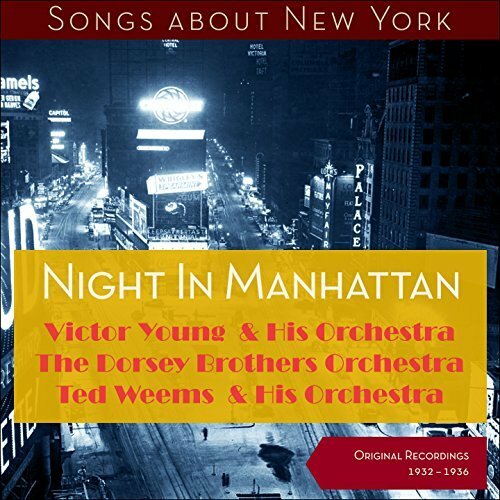 A throwback track — “Night in Manhattan” — introduced in the 1936 film The Big Broadcast of 1937 and afterwards recorded on September 24, 1936 by Ted Fio Rito and His Orchestra with vocal by Muzzy Marcellino was released June 30, 2017 on the new album, titled after the song, Night In Manhattan (Songs about New York – Original Recordings 1932 – 1936). 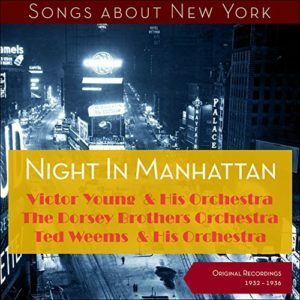 While the song, “Night in Manhattan,” written by the famous songwriting team Leo Robin and Ralph Rainger, is credited as one of the songs in the film, it’s only heard instrumentally during the opening credits and not vocally. While Leo Robin was a reporter in Pittsburgh where he grew up, one night, he went to the theater and his whole life changed. He had a new ambition to become a playwright. The lure of Broadway had taken hold and he realized he had to go to New York to pursue his dream of writing for the theatre. He even moved to Greenwich Village where he wrote a song for The Greenwich Village Follies. These little revues were very important in showcasing new talent and giving artists their start. Then, Leo met the Gershwins and Leo’s attention soon turned to the Broadway stage and he worked on many Broadway shows. 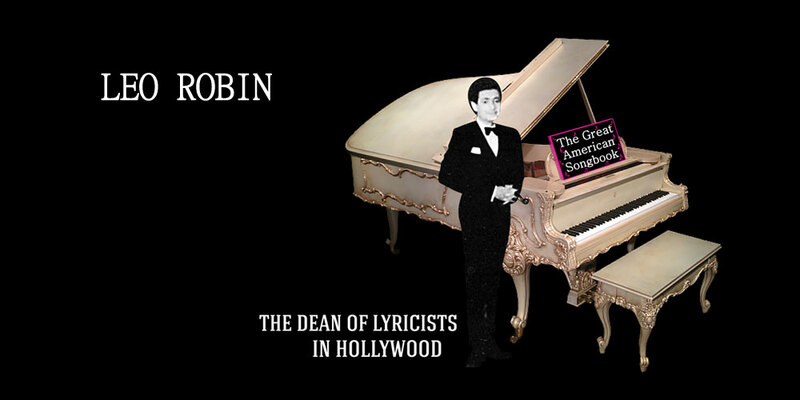 Of course, Leo returned to Broadway, after spending twenty years of writing songs in Hollywood, and, with composer Jule Styne wrote the acclaimed lyrics for the smash hit, Gentlemen Prefer Blondes. Just a few years later, Marilyn Monroe would reprise the role in the 1953 movie version. Popeye and Olive Oyl took to the dance floor in 1937’s Morning Noon and Night Club. The cartoon opens with a sign advertising the appearance of Popito and Olivita at Wimpy’s Cafe. This pair of dance characters was a takeoff on the most famous dancers at the time — Veloz and Yolanda — so it made sense to do a dancing routine like something that sounded Latin. Then a fist comes in from off screen, and socks a hole in the sign, obliterating Popito’s face. It’s Bluto, and he’s not so happy about the prominence the pair is getting. Bluto does this to every sign he sees, including one erected high up near an apartment building. Parkng himself near the stage door, he tries to make an advance on Olivita but is rejected completely which causes him to swear revenge. Night in Manhattan is a 1937 Paramount musical short film, starring Glenn Ford in his first screen role and directed by Herbert Moulton. A gentleman emcee, Glenn Ford, is the host of a Manhattan nightclub who introduces a series of musical acts, all of which are, like him (he says), making their screen debuts. A toe-tap dancer, two singers, another tap dancer, a dance duo and a vocalist singing “Night in Manhattan” round out the show, which ends with a montage of Manhattan nightlife. By the middle 1930’s, the best-known team of specialty dancers was Veloz and Yolanda. This pair had come up the hard way, through various Broadway shows. They were major names by 1932, appearing in revues on the Great White Way, and in top supper club spots as well. Veloz and Yolanda specialized in Latin dances – notably the tango and the rhumba. This pair of dancers, as previously stated, were the inspiration for the dancing characters and their dancing routine in the 1937’s cartoon Morning Noon and Night Club. They were so big that they could afford to carry a full orchestra, first led by Shep Fields, then by George Hamilton. Fields left the Hotel Pierre where he was a bandleader to join a roadshow with the dancers Veloz and Yolanda. A contest was held in Chicago for fans to suggest a new name for the Fields band, in keeping with the new sound. The word “rippling” was suggested in more than one entry, and Fields band became known as Shep Fields and His Rippling Rhythm. 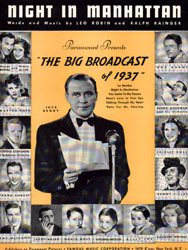 It was fitting that Shep Fields and His Rippling Rhythm Orchestra instroduced “This Little Ripple Had Rhythm,” written by Leo Robin and Ralph Rainger, in the The Big Broadcast of 1938. Shep Fields and His Rippling Rhythm Orchestra performed a great many songs written by Leo Robin and Ralph Rainger including “In a Little Hula Heaven,” “Mama That Moon Is Here Again,” “Moonlight and Shadows,” “Rendezvous with a Dream,” “Sweet Is the Word for You,” “Talking through My Heart,” “Thanks for the Memory” and “You Came to My Rescue.” Fields also has another animation connection for his role in a Harman & Ising sequence in The Big Broadcast of 1938, built around the song “This Little Ripple Had Rhythm.” For your enjoyment, here is a magical musical moment of Shep Fields and His Rippling Rhythm Orchestra performing “This Little Ripple Had Rhythm” in the The Big Broadcast of 1938.